When it comes to keeping me happy, I'm pretty easy. Throw me some gadgets, feed me some food and I'm as happy as a pig in muck. When the PR for Windows Phone came knocking asking if I wanted to play with their new phone and eat at the not-yet-open Social Eating House, I jumped at the chance. I've been on iPhone since the beginning but have been seriously been considering a move away to the newer, more innovative platforms. As for Social Eating House, it's basically yet another brasserie with a British twist, but it is the newest opening from Jason Atherton so always worth checking out. Starting out at the Soho Hotel, we ran through the setup and met the men behind the Windows Phone operating system and Nokia. As you would imagine, they were pretty passionate about the product and ran through a sequence of pretty cool features. In built sat nav with free downloadable global maps, augmented reality recommendations around you, a rather smart interface with plenty of flexibility. There was no denying, there was a lot of thought put into the flow and design of the interface, and there are enough gadgets to keep any geek happy. However, the main focus of the event was the camera. Boasting a Carl Zeiss lens with what Nokia call PureView, it has in built stabilisation to help you out with tricky low light shots or shots on the move. Social Eating House would be a perfect testing ground. Social Eating House is a lot more casual than it's predecessor on Pollen Street. Lots of bare brick walls and moody lighting abound, all very current for the London dining scene and tricky when it comes to taking pictures. As we played with the settings on the phone, I guess the one time where it was acceptable to play with your phone at the dining table, jars with mixed contents. I really don't love this 'jars' concept. They are fiddly to eat out of and I can't even imagine how hard it would be to try and 'plate' these up. All that having been said, I managed to get a few tastes of the spiced aubergine and mackerel tartare, which were both decent enough. 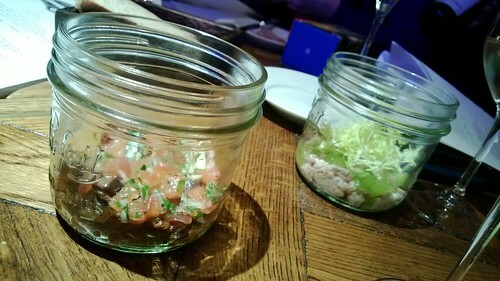 The third of salt cod brandade was the stand out and delicious, I was just disappointed that the contents of the jar were so small. The starters menu all sounded very decent, but the Duck "Smoked ham, egg and chips" stood out for me. Soon enough, slivers of delicious duck ham, a deep fried breaded egg with an oozy yolk and a few tiny chips acting as soldiers arrived on a wooden board. There's not much to say about this. 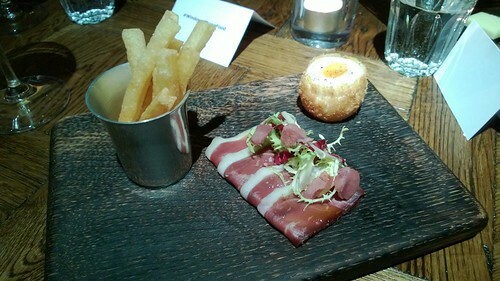 The duck ham was meaty and slightly gamy, the egg was well cooked, and the chips were too small and too sparse. On the whole, nice enough dish, but really nothing that special to me. Other starters were better in my opinion. A steamed bag of ceps added plenty of theatre, and when the bag was opened, the smell was intoxicating and had me salivating from two seats down. Probably best of the lot, octopus carpaccio with orange and black olive, a great balance of flavours and the most elegantly presented. I have a terrible compulsion not to order what others had already ordered, always bowing to the curiosity of what the other dishes would be like. 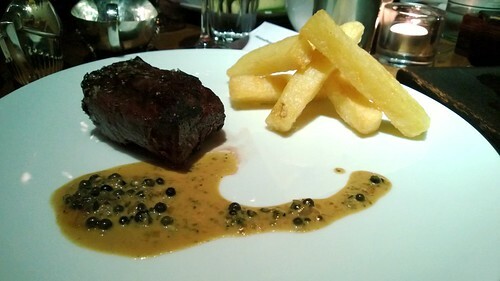 In this scenario, I ended up with the onglet, which is something I have grown to love and I was definitely looking forward to it. What arrived was confusing. First, another wooden block (they seem to love serving things here on wooden boards) with my rather small looking piece of meat. Next, two separate sauce boats with a Bearnaise in one and a peppercorn in the other. Alongside, a little metal bucket containing my chips and rounding this off, a bowl of salad. By the time all my accoutrements for my meal had turned up, it took up half the table. I did my best effort at plating up my own dish, and all components were decent enough, although I can't really say any of it was particularly special. Desserts were all pretty out there. 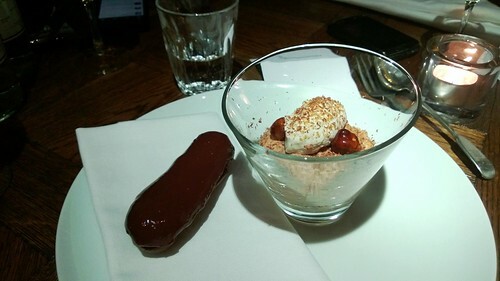 Pineapple baked in salt and szechuan pepper, London Honey almond sponge with a goats curd ice cream, lemon curd pie with a pepper crust pastry etc... As a big fan of chocolate, I opted for a milk chocolate mousse, praline, choc eclair and a salted caramel ice cream. What arrived was sadly slightly muted, a little bit of mousse and an eclair. By the time I realised that the salted caramel ice cream was inside the eclair, it left it a soggy mess, which was kind of sad. 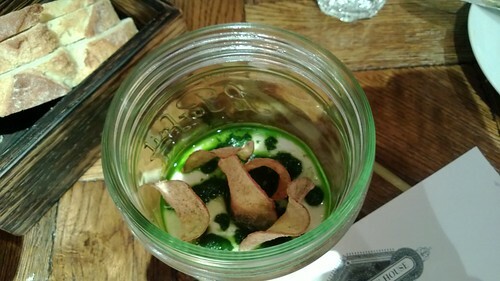 As a restaurant, there are flairs of some great things happening in the kitchen, but on the whole, I found most of what I ate well executed, but sadly a little boring. I fully appreciate that this was before it had even officially opened, and there is still plenty to like so it is not to be dismissed. As for playing with the phone, there was a lot about it I liked. I loved the tile interface, the easy access to not just apps, but phone functions, and the interface and the ability to customise is a great advantage. Some of the add ons like the built in travel adviser and sat nav are also of great value. I'm not a massive of the two tone white on black/black on white interface, it looks a bit clunky and I like things neat. As for the camera, the pictures which came out were sharp and actually seemed to work well in low light. The only issue seems to be the white balance, even with the additional features more accustomed to a manual digital camera, the pictures seemed a bit cold. Having said that, it's nothing a little manual editing wouldn't fix and I'm sure an update in the software would do just the same. Whether you're using an iphone, android or Windows phone, there is no denying that this is a great bit of kit. It doesn't quite have the polish of the iphone yet, or the flexibility of the android, but it has great potential. 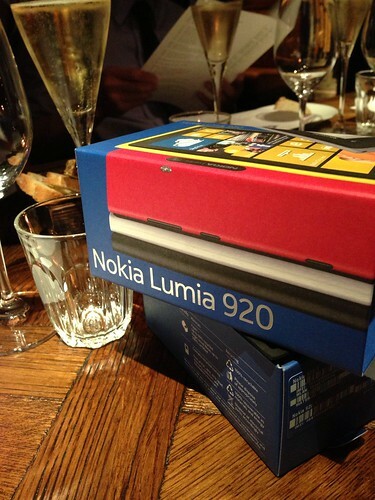 Can you bluetooth photos to a Macbook with a Lumia? Someone told me you couldn't.